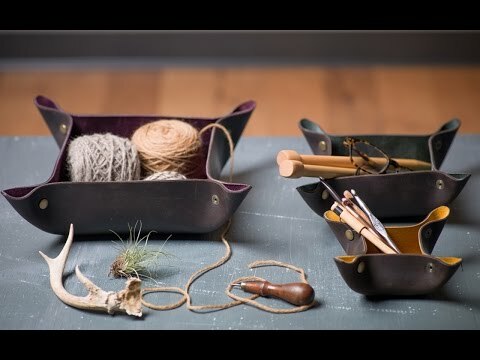 Leather containers designed to hold and store a wide variety of things including keys, spare change, remotes, and mail. Dyed suede is fused to the interior for a pop of color. Catch all for anything—keys, coins, wallet, lip balm, etc. 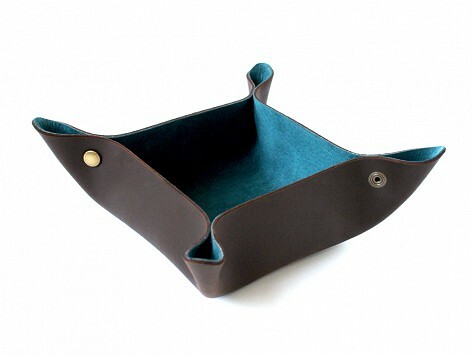 Dimensions: Small: 4.125" x 4.125" x 3"; Medium: 7.25" x 7.25" x 3.25"
Weight: Small: 0.5 lb. ; Medium: 0.8 lb. It's a lovely receptacle to put the TV remotes, my glasses and a few other articles and keeps the table top from looking cluttered and 'junky'. Well made and exactly as descrbed. I got the medium in teal and it arrived quickly. I plan to buy another. Stow your stuff in style with Catch-Alls that, as the name suggests, are designed to contain just about anything.